My local fisho tells me that his mackerel is line caught, and that’s always a good thing as far as sustainability goes: no bycatch and no complete decimation of breeding populations. Good Fish Bad Fish lists mackerel as sustainable too. It’s high in Omega 3 and low in mercury, and it has a nice firm texture with few bones. It’s an oily fish that goes well with acid tomato based sauce, and I have both tomatoes and leeks in abundance in my garden at the moment. Chop 4 leeks into 3 cm pieces. There is usually hard to reach dirt in between the leaves, so I do this over the sink: take the outside leaves off and the end off the green leaves. Then chop from the bottom till I get up to where the leaves separate. Then peel off the outside set of leaves, wash the grit out, chop another segment and repeat until I have used all the tender white and light green parts and I’m left with the tough outer leaves. Add an equal quantity of tomato, roughly chopped if they are big tomatoes, whole if they are cherry tomatoes, and a slurp of good olive oil. Add plenty of salt and pepper, a couple of bay leaves and a sprig of thyme if you have it. If I am going out for the day, I use the slow cooker – set it on low with the lid off and leave. Eight hours later, it is a thickish liquid tomato sauce with soft braised leeks. This is the best way and it is so nice to come home to dinner pretty well sorted. If I am home or I want it faster, I use the slow cooker on high for about four hours, or an ovenproof dish with a lid, in a hot oven for 20 minutes with the lid, then another 10 minutes or so without the lid to reduce a bit. You want the sauce to be liquid , but not so liquid that it flows off the plate. Fry the mackerel (fillets or steaks) quickly in a little olive oil, taking care not to overcook and serve on a bed of leek and tomato sauce. Couscous, green beans and zucchini all make good accompaniments. I had two recipe successes at the beach, and this is the other one. I live with a bloke whose idea of bliss is standing thigh deep in ocean on an overcast day using all the sensory skills of a hunter. We were at a good fishing beach, there was a nice east coast low making perfect conditions, he spent many hours at it. And still, we ended up at the fishmonger. There is an odd contradiction in buying fish because you can’t catch any. It makes “sustainable” species a very clear and present idea. I stood there wondering what to get and feeling very conflicted. Then the person in front of me bought a $3, 500 gram packet of little fish. “Just flour them and fry them and eat them whole, with a cold beer. They’re wonderful”. I had no idea what they were but working on the principle that small fish are lower down the food chain and less threatened than larger fish, I took a punt. OK, so I’d never had anchovies before any way except out of a tin. But I followed the directions and they were, as promised, wonderful. Tossed in flour with a little salt and pepper, deep fried in small batches in a pot of light olive oil for just a couple of minutes, eaten whole. I did make up a bit of a dipping sauce with lemon juice, garlic, a little bit of chili, finely chopped onion and finely chopped parsley. And we had a good debate about whether they were better with the head or without. When I got home I looked them up on Australia’s Sustainable Seafood Guide from Australian Marine Conservation Society, and the banner image is anchovies. About as sustainable as you get. Spanish tapas recipes take the head off and butterfly them removing the gut, and this wouldn’t be hard to do, but with the little ones we had (about 3 inches or 75 mm long) it’s hardly necessary. Anchovies are up there with sardines as a source of omega 3s and no risk of mercury like the larger predator fish, and omega 3s are important for a whole range of health benefits from cardiovascular to mental health. And $6 a kilo. A new favourite. I read a good little article this morning from The Conversation website. I go for canned salmon these days in preference to tuna. My Very Herby Salmon Patties are a regular, very tasty, quick, easy, fast, and very very healthy dinner. Canned salmon isn’t ideal either, but it’s within my boundaries for acceptable. Sadly, tuna has been outside those boundaries for many years now. You can read the full article at The Conversation here. It’s not long, and it’s well worth the read. This has been a very recurring staple in our household lately, one of my very favourite recipes for both dinner parties and just us at home. It’s really fast and easy and cheap and healthy for weeknight dinners, but also good enough that it’s been our dinner party go-to recipe lately too. It’s easy to glam it up a bit and serve with crusty sourdough to make it special. It’s becoming harder and harder to catch, or buy, sustainable seafood these days. Luckily, squid is normally listed as sustainable in most guides. Squid breed fast and die young and their natural predators are being fished out. Squid are a really healthy seafood, a good source of omega 3 and, like many seafood, of a big range of minerals like copper, selenium, zinc and magnesium. And it’s cheap. My local supermarket has 500 gm packs of frozen, cleaned squid rings for $6. The other main ingredient in this soup is Southern Blue Whiting, also listed as sustainable and also available frozen and very cheap. Fresh sand whiting is so gorgeous, it would be criminal to do anything more to it than dust with flour and fry. Southern Blue Whiting, though, isn’t sand whiting, isn’t even really a whiting, and especially if it is frozen, it isn’t a good frying fish. So it is quite nice to find a way to turn it into something gourmet. It’s a bit of a “make it up as you go” recipe because lots of substitutions are possible. I tend to make a big pot even just for the two of us, and we take it for lunch or eat it for a few days in a row. In a big soup pot, add a swig of olive oil and saute a chopped onion and several cloves of garlic till they start to soften. Add a couple of chilis finely diced, more or less depending on how hot your chilis are and how spicy you like things. Add a good cupful of chopped tomatoes. at least one leafy green like silver beet or amaranth or baby spinach, but steer clear of strong cabbage flavours. a few of vegetables like capsicum, green beans, snow peas, celery, carrots, zucchini, squash. Again, steer clear of broccoli or things in that family. Saute a little bit, then add water to cover. When you add the water, add kaffir lime leaves. I like four or five of them, but adjust according to your taste. Leave them whole and remove (if you can!) before serving, or just warn people to leave them. If you don’t have kaffir lime leaves, just double up on the lemon or lime at the end. Simmer the soup for fifteen minutes or so. Then add another good half cup of chopped herbs. I like lemon or lime basil and Vietnamese mint best, but you could swerve towards cilantro or coriander, or Thai basil, or towards dill or even fennel. Add 500 grams of squid rings and (optionally) whatever you want in other seafood. For everyday eating, I add about 300 grams of chopped whiting, skin off. To glam it up you can also add baby prawns or clams. You can even add them frozen if you like. Bring back to a simmer and simmer for 5 minutes or so, until the fish is cooked through. Now taste and add fish sauce and lemon or lime juice to taste. You can add quite a lot without it being too much. Serve with a good sourdough. It’s not a very interesting photo till you know what it is. This is the culvert crossing our creek after over a month now of pretty non-stop rain and several floods. The next crossing down is so brown that you cannot see the bottom and the river as it runs through town is the colour of cocoa. But this one is clear. Marine ecosystems are under such huge pressure that they are collapsing world wide. Our children are unlikely to be able to go fishing and catch fish for dinner easily. Our grandchildren may not be able to afford to eat fish at all. A study published in the peer reviewed journal Science recently warned that “all commercial fish and species could collapse by 2048“. That’s within my lifetime. My grandfather used to be able to take his fishing rod down to the ocean at his shack at Bribie, near Brisbane, and reliably come back with dinner. My grandchildren may not ever get to experience catching and eating fish at all. So so sad, so unforgivably irresponsible. Climate change is the big threat, with its concurrent ocean acidification. But pollution, habitat destruction, overfishing, and leaks from oil and gas extraction are up there too. And one of the big sources of pollution is turbidity, which means brown water after rain, where soil has washed into it. It’s caused by bad agricultural practices and by clearing along creeks and rivers. From winter 2000 to winter 2003, I spent most Saturdays and a fair few Tuesdays clearing lantana and planting a forest along several kilometers of degraded creek frontage. Already, a decade on, I can see the effect in a creek that runs clear even after flooding rain. Landcare work can seem like a drop in the ocean. It can seem so long term and so little that you think, why should I bother, unless everybody does it makes no difference. Like much of what we consider doing for the sake of the environment. But for me, every time I cross that creek, I feel happy and hopeful and capable of making a difference. And very proud of us – Rod and Franky and Wally and John and Alex and Casey who stuck it out for the whole three years and all the others who worked on the project from time to time. I hope your grandchildren get to eat fish. New Zealand green lipped mussels are listed as sustainable, and our local supermarket had them this week for less than $5 a kilo. We may be the last ever generation to be able to readily afford seafood like this so it had to be worth inviting friends for dinner. They have a lot of food miles, coming from New Zealand, and they’re frozen. But in the scheme of compromises you need to make about seafood, that’s not too bad. Mussels are a really good source of Omega 3s and there is some evidence they could have good anti-inflammatory properties. As we come into the hayfever season, that’s a plus for me. A bowl of mussels like this with some good sourdough for dipping is a real gourmet feast. Makes four big bowls full. Scrub and de-beard 2.5 kilos of mussels. Sauté a couple of chopped onions in a little olive oil for a few minutes till they become translucent. Add lots of garlic (as much as you are willing to add this time of year, when garlic is starting to run really low!). Add a couple of finely chopped chilis, depending on how hot your chilis are and how spicy you like your food. I have pickled and dried chilis for just this time of year. Serve with a good crusty sourdough for dipping, or over rice to soak up the juices. Provide a fingerbowl and a bowl for the shells, and don’t even try to be elegant! The fishing hasn’t improved. He’s still catching mostly Australian salmon. Luckily, the recommendations are to eat oily fish at least a couple of times a week, and Australian salmon are one of the best oily fish. 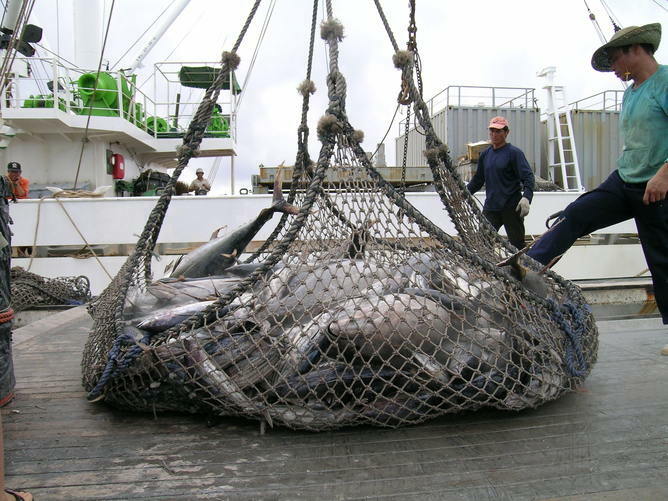 And they’re one of the few on the list that are sustainable – gemfish are a threatened species, blue-eye trevalla are often long-line fished, Atlantic salmon are all farmed, and canned tuna is overfished, threatened, and fished in wasteful and destructive ways. Australian salmon may not be a prized eating fish, but you can make a dinner from them that people will go back for seconds. Which is just as well, because they’re a big fish – you get a lot of meals from one. The tricks are: they must be very very fresh, filleted to remove the dark “blood” meat, the skin and the fat just under the skin, and used in recipe that includes some acid (tomato, lemon) and involves flaking them. In a little olive oil in a large pot, saute a chopped onion till translucent. Bring to the boil and simmer for 10 minutes or so until the vegetables are tender and the fish is flaked. Take the pot off the heat and stir in 5 good dessertspoons of plain low fat yoghurt. If you bring it back to the boil at this point, the yoghurt will curdle. It will still taste good but it won’t look as creamy. Serve with rice and chopped fresh coriander to sprinkle on top. The fishing hasn’t been good lately. He comes home with either nothing, or bream (which are one of my lesser favoured fish) or salmon. Australian salmon are not a salmon at all, but a sea perch. They’re listed as sustainable and that’s at least partly because they are notoriously not a prized table fish. They are a good source of omega 3 though, and they can be turned into a good fish dinner with a bit of care. Salmon are strong flavoured, in the same way that many of the oily fish that are really good for you are – think mackeral, herring, sardines. The flavour gets stronger, fast, after they are caught, so they really need to be very fresh. The dark “blood” meat and the fat just under the skin is the strongest, so they should be filleted to remove it. They go best with some acid like lemon or tomato and strong balancing flavours. And the texture is chewy, so they work best in something where they’re chopped, flaked or smoked. But after all that, they do make very good curries, casseroles, stews, soups and patties, maybe even better for being stronger flavoured. This is one of my favourite ways to use them. Makes about 14 fish cakes. In a pressure cooker, you will need just a dash of water and 5 minutes. In a pot you will need a bit more water and a bit longer. Cool the fish until you can handle it, then discard the bay leaves and use your fingers to flake it into a bowl, feeling for bones as you go. Meanwhile, cook 300 grams of diced potato (2 medium spuds) till soft. Shape into patties and shallow fry in olive oil till golden. They’re good with salad or vegetables for dinner, and surprisingly good cold for lunch. Mullet are undervalued. My partner remembers seeing them buried on the beach by the thousands, bycatch regarded as too cheap to bother selling. Though those days are over they’re still regarded as sustainable, and really fresh mullet are one of my favourite eating fish. Fresh fillets are not too strong flavoured, and they’re super cheap and a really good source of Omega 3. Tip the mixture out onto a plate. On another plate, put two good dessertspoons of plain low fat yoghurt. Dip the mullet fillets first in the yoghurt to coat, then in the crumb mix. Pat it on. Shallow fry the fillets in olive oil for a few minutes each side until golden.